A Priest is a healer and caregiver who has taken vows to aid those in need, especially bold adventurers. But don't make the mistake of thinking all Priests are pure and called to serve in the light: dreadful artifacts may bestow Unholy demonic abilities as well. 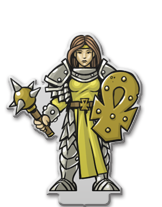 Priests will have good armor to withstand the rigors of battle, but their true specialty is bestowing all manner of blessings and support for their fellow party members. "Elven Priests are highly mobile support characters who can both heal and curse from a distance. Though they have decent melee weapons, they can't hang in a fight for too long. At higher levels they gain even more powerful Elf movement Skills." "Human Priests are healers and fighters who can fight in close, aid their friends and curse their enemies. At higher levels they get access to Skill cards that let them manipulate their card draws." "Dwarven Priests are resilient support characters. 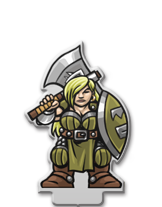 With their natural Dwarven toughness, they can hang in a fight but they may have trouble getting into range. At higher levels, their Dwarven Skills make them even harder to hurt." All Priests begin with a Divine Weapon slot, a Divine Item slot, and Boots. They start with a Crude Healing Charm equipped. At level 2 they put on Divine Armor. At level 3 they equip another Divine Item. At level 4 they learn a Divine Skill (table). At level 5 they wield a second Divine Weapon. At level 6 they start using a Shield. At level 7 they find room for a third Divine Item. 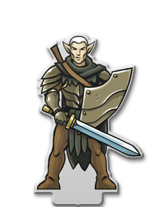 And at level 8 their final slot is for a special Racial Skill (Human (table), Elf (table), or Dwarf (table)). This page was last modified on 2 September 2013, at 02:59. This page has been accessed 31,999 times.